Discerning individuals in Europe and selected major cities regard Loewe highly as the leading premium brand in the home entertainment systems sector. We impress our customers with products with a timeless aesthetic, technology for the senses and ease of operation. Our work is based upon our central brands values: a minimalist design, meaningful innovation and exclusive individuality. Loewe have created a fascinating brand environment, which encompasses brand communication in addition to the products and also premium service. The Loewe Reference sets new standards. Even at first glance,what is clear is it offers crystal clear sound, brilliant images, and an amazing range of features – all at the highest level of perfection. You will not fail to be impressed when you encounter the Loewe Reference – it is a masterpiece! The Loewe Reference shows images on television and cinema in unprecedented quality – far sharper in more detail than ever. The impressive crystal clear sound comes from The Loewe Reference Standpseakers. Digital music, films and photos can be enjoyed in Reference quality by transferring them to the System. Offering 8,000 radio stations on the internet and an array of podcasts, you can access variety world over on the Reference. The Loewe Reference gives HDTV quality and allows for the television to be paused and continued at any time. The Loewe Reference can also transmit sound through your home as and when you want it. Energy efficient – all the Loewe televisions have been given an A or B efficiency classification despite their integrated functions. LOWE MEDIACENTRE – The most complete system in the world! 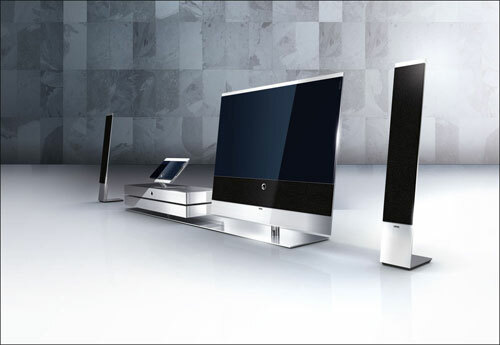 The Loewe media centre is the most complete system that Loewe has ever produced. Not only plays CDs and DVDs but it also receives radio via the internet, satellite, antenna and cable. The media centre allows you to listen to music stored on your network or hard drives as well as on your iPhone or iPod. Aesthetically pleasing, its minimalist design features a slim high quality aluminium and glass housing which anyone would be proud to have in their home. Loewe Connect – created to ensure unrivalled enjoyment. Digital media allows for unprecedented possibilities – Photos, music, podcasts, film files, iPhone, iPod, Internet TV and radio, laptop, net book computers, desktop PCs as well as the smart card for Pay TV, as well as digital cameras. Loewe Connect was created to allow all this to be networked, avoiding confusion and maximizing enjoyment. Loewe Connect offers 3D cinema in impressive depth, precise and natural transitions. The LED backlight improves contrast and picture quality letting you see the high speed sequence in perfect quality. That’s not all, not by a long stretch! The Loewe Connect is an internet TV – like you have never seen before. Anything you can see on the internet you can see on your Loewe TV but in brilliant resolution. Loewe connect can receive more than 8,000 stations from all around the globe. It also lets you listen to the radio even when you are out thanks to the Loewe internet radio iPhone app. Loewe Connect is a home cinema that lets you watch what you want and then streams the recordings throughout your home. Thanks to the Loewe DR+ streaming (with Follow Me Function) you can pause live TV in the bedroom and carry on watching it when you are ready in the living room. Loewe Connect offers you independence in home entertainment. You can access the recordings you have on your Loewe DR + hard disk recorder from another Loewe TV through the home network. Loewe Connect is also photo television: for when you want to watch slide shows, but in XXL format! With the Power line, LAN,USB connection, or with the wireless WLAN connection available on the Loewe Connect, it’s simple to access your digital photo, videos and music stored in the network instantly. Easy to operate and energy efficient; Loewe Connect comes with a clear conscience.